Directions: Downtown Crestview corner of N. Main Street and Industrial. Truly priced to sell, this is a one-of-a-kind building great for investing in the rapidly growing Crestview area. With a perfect location in downtown Crestview's revitalized "Florida Main Street" state-designated historic district, this two-story circa 1925 landmark was built as a hotel with eleven rooms on the second floor which were converted into office space. It is situated thirty miles from the beaches of the Gulf of Mexico, near Fort Walton Beach, Destin, Pensacola & Navarre on the I-10 corridor in the fastest growing city of its size in the entire state; also near aerospace hub of Eglin Air Force Base with rapid growth due to BRAC realignment. 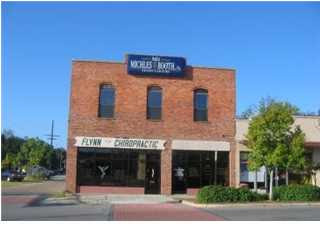 The first floor has two separate storefronts, one of which is currently a doctor's office and will relocate or continue with a lease. This storefront features terrazo flooring. The entire second floor has clear-coated tongue-and-groove heart of pine walls and ten-foot ceilings with exposed "Chicago Brick" on the outer facing walls. The second floor also includes a full kitchen, tiled floors, a gas range, crown molding and trim on all 17 second-story windows and solid wood custom cabinets as well as hand-built custom carpentry with cypress, cedar, and pine throughout. Each room has a ceiling fan. The second-floor bath features a custom-built tiled shower. There is a 420 square foot deck off the second floor as well. The exterior is all brick with new hurricane-insulated windows and 2 new insulated and tinted storefront windows. These are the all new 2000-2005 mechanicals: new A/C and heat pumps, electrical wiring, plubming, CAT5 data/telephone lines and amplified digital cable to current code in every room. This property need to be seen to be truly appreciated. It is ideal for office space or a restaurant/bar. A unique piece of property you don't want to miss. Owner may finance for qualified buyer. Press release came across my mailbox today. Who do you turn to for economic security along the Emerald Coast when the bottom drops from the real estate market? A study released by Enterprise Florida concluded that military spending remains one of the state's leading growth industries. It's particularly valuable to Northwest Florida, where defense-related spending accounts for 35 percent of gross regional product. l Eglin Air Force Base and Hurlburt Field generated $2.2 billion in defense spending. l Countywide, the economic impact of the military was $6.6 billion. l The average annual earnings per military job is approximately $81,300, or 199 percent more than the area's other jobs in industries such as farming, retail and construction. The air bases are "incredibly important for all the obvious reasons," said Jim Breitenfeld of the Okaloosa County Economic Development Council. "The high wages. The total spending." Though the report attributes 73 percent of economic activity in Okaloosa to defense-related spending, Breitenfeld said he wasn't alarmed because the bases are stable employers. "I don't know if we're dependent (on the military), but it would be a heck of a withdrawal if it disappears tomorrow," he said. Breitenfeld would like to see Northwest Florida diversify economically in areas where it has competitive advantage such as aviation and high-technology information processing. In Santa Rosa County, Naval Air Station Whiting Field contributed some $857 million to the economy. Its average annual military wage in fiscal year 2005 was $99,800. Overall, the military presence in Florida promises only to grow, the Haas report continued. By 2010, military spending statewide might have an impact of $59.5 billion, which would be $7.5 billion more than in 2005. "While Florida's economy has faced challenges during the past few quarters, particularly in areas hardest hit by the real estate slowdown, high-wage, defense-related jobs are somewhat immune to downturns in the business cycle," said Enterprise Florida president John Adams in a news release. "They provide strength in Florida's economy even in difficult times." FORT WALTON BEACH - Although its corporate office still will not confirm it, Kohl's is coming. The Okaloosa County Commission unanimously approved site plans for a new Kohl's department store to be located near the intersection of Beal Parkway and Hurlburt Road in Fort Walton Beach. With Tuesday's approval, construction is expected to start early next month, said John Kramp, site development manager for Kohl's. He said they hope to have the store open by the end of the year. "It's going to be a fairly long road (before the store opens)," Kramp said. "The timetable is up in the air." The first phase will be the demolition of the Bay Furniture building. The new 103,990-square-foot department store will replace the old Bay Furniture next to Winn-Dixie. The only question commissioners had about the project before its approval was about its storm-water retention. Storm-water guidelines are stricter now than when the furniture store was built, and Kohl's will have to upgrade the retention ponds. The Daily News contacted Kohl's corporate office Tuesday afternoon for additional information on the new store. Despite its impending approval, Kohl's would not confirm the store. "At this time, we've not announced any plans to open a new store in the Fort Walton Beach community," Kohl's spokeswoman Courtney K. Rogaczewski responded in an e-mail. "Kohl's has an ongoing real estate assessment process. At any given time, Kohl's is reviewing sites in communities nationwide. We do not comment on real estate speculation. When we have firm details, we are happy to share it at that time." That is the same response Rogaczewski sent to the Daily News last month. I was really happy to see this I would always find myself going to the Kohls in Ohio for this and that and its about time we got one of these. the time the new school opens. for locations to build a Junior and High School. REDI (Rural Economic Development Initiative). Welcome to the future Mossy Head! easy Interstate 10 access, railroad facilities, proximity to Eglin Air Force Base, reasonable housing costs, Walton County Industrial Park, Blackstone Development of Regional Impact (DRI), newschool and $200,000 grant for a community park .The area knows it is about to experience a tremendous growth spurt and long-time pillars ofthe community want to make sure that proper planning procedures are in place to ensure 'smartgrowth' so they can maintain the rural county atmosphere while at the same time becoming an economic force in the county. The Walton County Industrial Park, which encompasses approximately 333 acres, has been in the planning stages for many years. A master plan for the project was submitted on behalf of the Walton County Board of Commissioners to the Planning and Development Services Department in July 2006. The plan calls for 40%manufacturing, 40% warehouse and 20% of office space. Creating a master plan will encourage businesses to move into the park because it will facilitate obtaining a development order, which in turn means being able to start-up more quickly and begin the process of hiring new employees. The park is also part of an enterprise zone which provides incentives for businesses to locate there. I ran across an article I posted on my previous blog that I wanted to check out how things went now almost a year later here are the results. ORLANDO, Florida -Tucker Bayou, a 2007 Southern Living Idea House, was awarded the prestigious Home of the Year during the Best In American Living Awards (BALA) ceremony in Orlando. The innovative home was a result of strategic partnerships among Looney Ricks Kiss Architects, The St. Joe Company (NYSE: JOE), Haven Custom Homes and Southern Living magazine. Founding Principal J. Carson Looney, FAIA, of Memphis, Tenn.-based Looney Ricks Kiss Architects accepted the award. "Tucker Bayou is an example of how strong partnerships can work together to create innovative concepts in new home design and produce a home that is widely acclaimed by the marketplace," Looney said. "A collaboration such as the one we have created with Haven Custom Homes, The St. Joe Company and Southern Living will change the way people look at design and modular construction and will ultimately improve the future of neighborhood developments." Tucker Bayou was chosen as Home of the Year based on its architectural design by Looney Ricks Kiss Architects, site and landscaping by JOE, quality craftsmanship and architectural detail by Haven Custom Homes and interior design by Looney Ricks Kiss Interiors Group. Located in The St. Joe Company's WaterSound community in South Walton County in Northwest Florida, the home is a 3,544 square-foot, shingle-sided, tin-roofed Southern cottage that combines the comfort of an empty nester vacation home with features that suit the versatile lifestyles - both social and private - of today's families. Haven Custom Homes utilized modular construction for Tucker Bayou, resulting in a home that was substantially complete upon arrival to the site and assembled in a matter of days. Site and landscaping details were then completed by St. Joe and the home's interior design was created by Ann Parker with Looney Ricks Kiss Interiors group, working with the Southern Living design team. "Every partner contributed their expertise, from the initial design to the interior details, to create Tucker Bayou," said John Ragland, executive vice president, Land Acquisitions and Marketing for Haven Custom Homes. "We were privileged to work with such esteemed partners on this project and look forward to creating more innovative, award-winning homes in the future." "With this project, we have advanced the art and science of homebuilding in Northwest Florida," said Jerry M. Ray, The St. Joe Company's Senior Vice President for Strategic Alliances. "Ultimately, this award demonstrates that a group of best-in-class strategic partners can effectively deliver an extraordinary product for homeowners. We look forward to this award-winning approach to homebuilding in all of JOE's Florida markets." The St. Joe Company, one of Florida's largest real estate development companies, and Haven Custom Homes, one of the nation's leaders in the construction of modular homes, formed a strategic alliance in 2007 to bring state-of-the-art building techniques to JOE's communities in Northwest Florida and JOE's RiverTown near Jacksonville, Fla. Haven Custom Homes also has a strategic partnership with Looney Ricks Kiss Architects to create modular homes rich in architectural detail and design. For more than 30 years, Haven Custom Homes has provided a unique approach to off-site construction. Partnering with local builders, Haven Custom Homes has delivered more than 350 quality homes each year to discerning buyers with homes prices ranging from $300,000 to $2.5 million. Haven Custom Homes was acquired by Wind River Holdings in late 2005, a private holding company out of King of Prussia, PA, and is poised to make significant expansion in the homebuilding business. Haven Custom Homes currently operates environmentally protected home building centers in Pennsylvania and South Carolina, with future expansion into other regions to meet the growing demand of its quality homes. For more information about Haven Custom Homes, visit www.HavenHomes.com or call (410) 694-0098. Founded in 1983, Looney Ricks Kiss is an architecture, planning and interiors firm with offices in Memphis, Celebration, Rosemary Beach, Jacksonville, Nashville, Dallas, Baton Rouge, La., Boulder, CO and Princeton, N.J. The firm has been commended by developers across the nation for its success in the planning and implementation of mixed-use developments, urban infill projects, downtown revitalization and traditional neighborhood developments. To date, the firm has received more than 450 awards of recognition for design at local, state, regional and national levels. For more information about Looney Ricks Kiss, visit the company website at http://www.lrk.com/. The St. Joe Company, a publicly held company based in Jacksonville, is one of Florida's largest real estate developing companies. The company is primarily engaged in real estate development and sales, with significant interests in timber. Its mission is to create places that inspire people and make JOE's Florida a better play to live, work and play. Sponsored by Professional Builder magazine and the National Association of Home Builders, the BALA program showcases homes that illustrate design quality, succeed in the marketplace and exemplify the "Best in American Living." To qualify, homes must have been completed or communities opened between May 1, 2005, and July 12, 2006. A total of 106 award winners in 41 categories were chosen from more than 559 entries. The 2006 BALA competition's panel of 12 judges was composed of builders, marketing experts, architects, land planners, developers, design professionals, interior designers and Professional Builder editor.